WVU School of Pharmacy announces Dean's List for fall 2017 term. 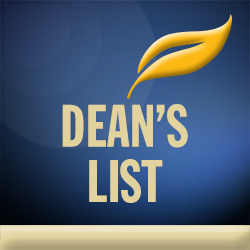 Congratulations to all of our students who made the Dean's List! To make the list, a student must achieve a GPA of 3.5 or higher. Each recipient gets a signed letter from School of Pharmacy Dean, Bill Petros. Below is a complete list. You may also visit https://lists.wvu.edu/deans for Graduation Honors and the President's List.